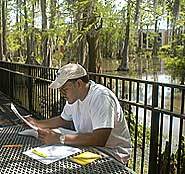 The University of Louisiana at Lafayette will administer the ACT Residual Exam on Nov. 22 at 8 a.m. in the H.L. Griffin Hall on campus. Students should bring $35 cash or money order, two #2 pencils and a picture ID. No pre-registration is required. The ACT Residual test is intended as an opportunity for UL Lafayette applicants to be tested for admission if a student was unable to take one of the ACT exams given on a national test date. Students should report to the lobby of H.L. Griffin Hall at least 25 minutes early. This is the last ACT Residual to be given before the Spring 2004 semester. Results will be given Nov. 25 after 1 p.m. in Lee Hall, room 115.